While J.T. Silence is away at war, a man he trusts betrays him. When Silence returns, he finds his wife murdered. Now, he’s out for vengeance—and he intends to kill Silas Brady for what he’s done, no matter how long it takes to find him. A wealthy rancher, Frank Decker, buys Brady’s willingness to use a gun. But Silence knows Brady can’t hide forever, and when the man from his past crosses him again, he takes action. The killing of an entire Jewish family on their way to settle their claim, and violent threats against Silence’s old friends, add up to more than a coincidence. When Silence discovers the plan the railroad has to lay track across the very land the settlers were killed for, he knows he has to see Decker and his henchman, Brady, dead. With only a young emigrant boy and Judge Henderson’s apprentice to help him, Silence vows to see the boy claim his land his family gave their lives for—but first, he’s got to kill Brady and Decker. 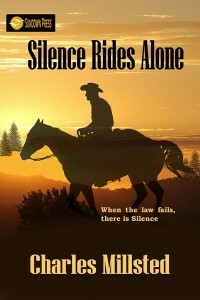 And though Silence Rides Alone, there’s a young woman who is determined to do what she can to help the man she loves.